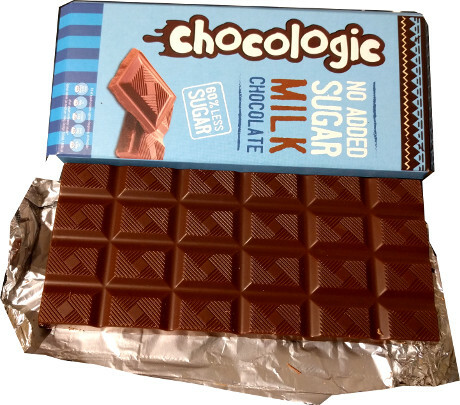 I was interested to see this No Added Sugar chocolate bar called Chocologic. It's available in three varieties: Milk chocolate, Belgian Dark Chocolate and Milk Chocolate with Hazelnut. All bars are 80g in size. The milk chocolate and hazelnut chocolate bars have ‘60% less sugar’, compared to other similar chocolate bars in the UK market, while the dark chocolate contains '90% less sugar'. I picked up a bar of the milk chocolate to try it out. I rarely eat chocolate these days, apart from the odd square of Ombar sitting in my fridge door. I really love chocolate, any chocolate, but it’s so addictive I decided it’s easier to just not buy it. And if I do buy any, it has to be for its health properties. This means it should be at least 85% cacao. The ingredients in the Chocologic bars are interesting. As it’s a milk chocolate it contains milk powder and to sweeten it uses stevia or rather steviol glycosides along with erythritol. This is the same combination used in Truvia and the newer Whole Earth sweeteners. What’s particularly interesting is the inclusion of the fibres in the form of inulin (derived from chicory root), oligofructose (a prebiotic and insoluble fibre) and dextrin (another fibre and derived from glucose). All help lower the glycaemic load meaning it won’t cause a spike in blood sugars. These ingredients also give the chocolate a high fibre content which isn’t something you’d normally find in chocolate. So you could almost eat it as a laxative! It’s best to stick to the serving size of 4 squares which is 64 calories for the milk variety, 67 calories for the hazelnut and 58 calories for the plain variety. See here (inulin) for more information on inulin and oligofructose and here for information on dextrin. I tried a couple of squares. Having not eaten ‘normal’ chocolate for a few years, to me it tasted like any regular milk chocolate. It’s possibly not as sweet as I remembered but it has the same texture and mouth feel as regular chocolate. My daughters were more than happy to taste test for me. One thought it was nice, but said there was something different about it. She asked if it was coconut chocolate! She said it tasted sweet enough but she could detect a slight bitter undercurrent after finishing her piece. The other daughter said ‘yummy’. But then said she could taste something bitter but that she still liked it. By then next day, the entire bar had been eaten courtesy of hubby and the two girls. I didn't get to try another square! If I was a regular chocolate buyer, this is one I’d go for with the plain chocolate being the ‘healthiest’ of the three as it has the least sugar, fat and salt content. All of them benefit from the fibre and much lower sugar content. Available in branches of Tesco and Morisons supermarkets. To learn more about the fibre in Chocologic, have a read about inulin and oligofructose in this article in the Journal of Nutrition. Nutrition per 100g (Milk Chocolate): 484 Calories (64 calories per 4 pieces), 36.2g fat, 22.9g saturated fat, 33.7g carbs, 20.9g sugars, 17.0g fibre, 7.9g protein, 0.62g salt. Nutrition per 100g (Belgian Plain chocolate): 432 Calories (58 calories per 4 pieces), 34.8g fat, 21.9g saturated fat, 18.7g carbs, 3.2g sugars, 34.8g fibre, 5.3g protein, 0.02g salt. Nutrition per 100g (Hazelnut Milk chocolate): 499 Calories (67 calories per 4 pieces), 39.1g fat, 21.1g saturated fat, 31.8g carbs, 19.3g sugars, 15.3g fibre, 8.5g protein, 0.56g salt. Suitable for vegetarians. May contain nuts and gluten (wheat). Ingredients (Milk chocolate): Cocoa butter, full milk powder, alimentary fibres (Dextrin, inulin, oligofructose), cocoa mass, whey powder (milk), sweeteners (erythritol, steviol glycosides), emulsifiers: soya lecithin, natural flavouring (vanilla). Ingredients (Belgian Plain chocolate): Cocoa mass, alimentary fibres (Dextrin, inulin, oligofructose), sweeteners (erythritol, steviol glycosides), cocoa butter, emulsifier: soya lecithin, natural flavouring (vanilla). Plain chocolate contains cocoa solids 55% minimum. Ingredients (Milk Hazelnut chocolate): Cocoa Butter, Full Milk Powder, Alimentary Fibres (Dextrin, Inulin, Oligofructose), Cocoa Mass, Whey Powder (Milk), Hazelnuts (10%), Sweeteners (Erythritol, Steviol Glycosides), Emulsifier: Soya Lecithin, Natural Flavouring (Vanilla), Milk Chocolate contains Cocoa Solids 36% minimum and Milk Solids 30% minimum. I love this but shame they increased the price. They also do little ball things. Will stick to Sainsbury's own. Not 100% what they are: might be "bites" or "buttons" or something. Okay, pretty confident Tesco stopped selling the buttons of these now, but I saw them today in Morrison's. I think they were like £2 or something. So yeah, they're identical to the bars, just in little button form instead. I think people often use drops/buttonwin baking? I don't know. I purchased Belgain chcolate bar and am wondering how it could have more fibre that carbs? It says..."Nutrition per 100g (Belgian Plain chocolate): 432 Calories (58 calories per 4 pieces), 34.8g fat, 21.9g saturated fat, 18.7g carbs, 3.2g sugars, 34.8g fibre, 5.3g protein, 0.02g salt. "...18.7g carbs and 34.8g fibre.....I am not sure how this could be correct....can you clarify please? Thanks for your comment Michelle. The high fibre content in Chocologic is to do with the ingredients Inulin and Oligofructose. Have a read about them in the Journal of Nutrition (https://academic.oup.com/jn/article/129/7/1402S/4722577).